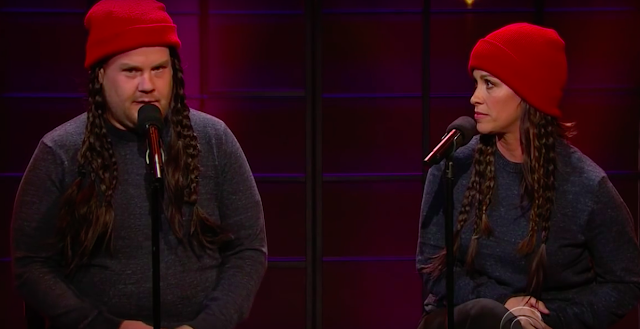 Basically Alanis Morissette and James Corden have come together to transform an Alanis classic into a 2015 masterpiece. Yes, "Ironic" has had a modern day digital updating. James and Alanis mention everything from Facebook to Tinder. Lines like, "it's like swiping left, on your future soul mate," or "it's a funny tweet, that nobody favs," made it clear this video couldn't just slip into the ether. It had to be shared. And here we are, and I'm a sharing it! Watch, enjoy, laugh out loud and, for those of you old enough to remember, see how far we've come since the original song first debuted. Let's put it this way- 1995 was back in the first days of dialup internet. It's a whole new and glorious world.